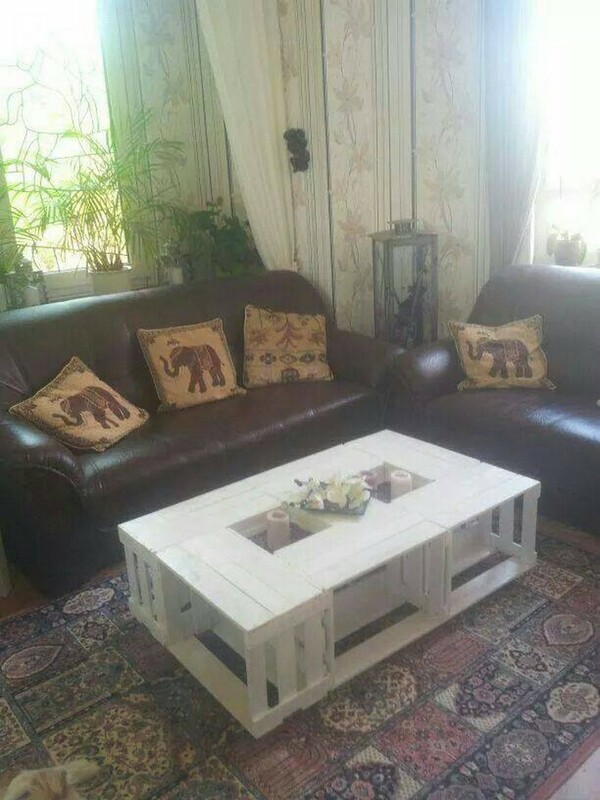 Our idea of different wood pallet creations has really earned such a massive response that we are really astonished to see the feedback. Let me tell you one thing very clearly, the comments and feedback of you guys is so encouraging and motivating for us that it literally keeps us motivated and also keep going. We have tried many materials for recycling other than the mere wood pallet like we have used wooden barrels, cable reels and also some wooden crates. 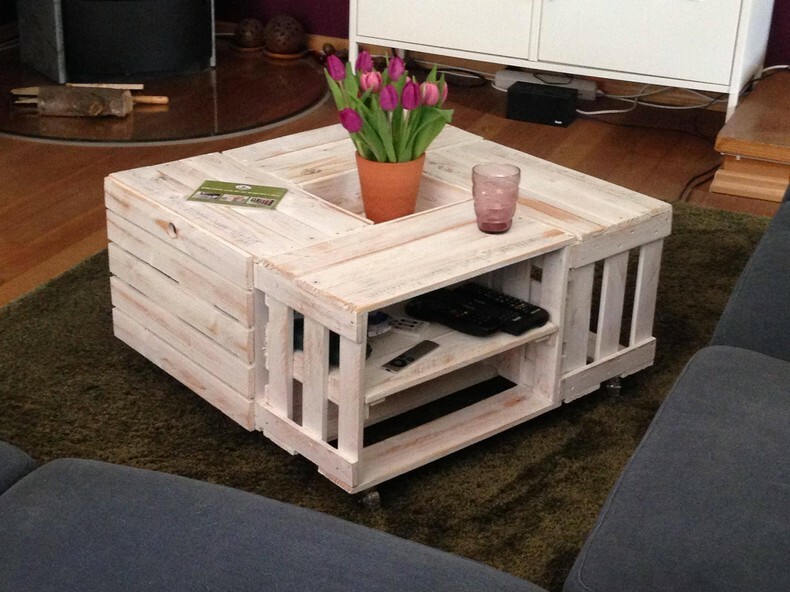 This time we have brought a whole range of table ideas with wood pallet crates. These crates that are used for multiple purposes and mostly to contain fruits, we are going to recycle a large number of tables with them. 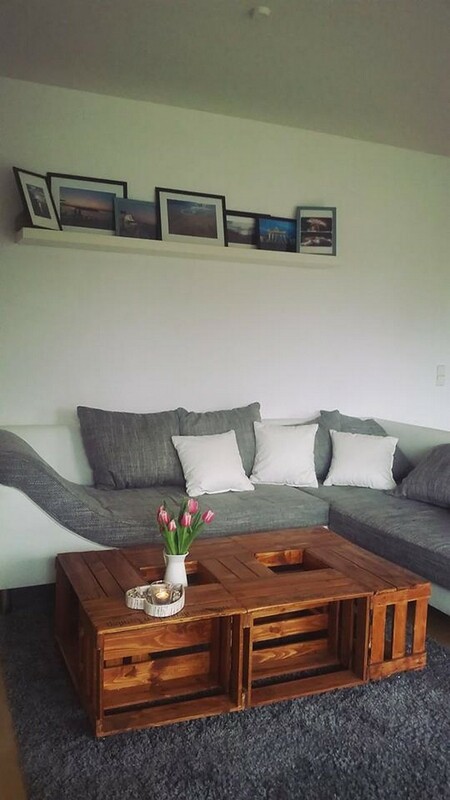 We have just started with an ultra stylish pallet wooden repurposed coffee table that is so sleek and shiny because of the material or the wood that we have used here. 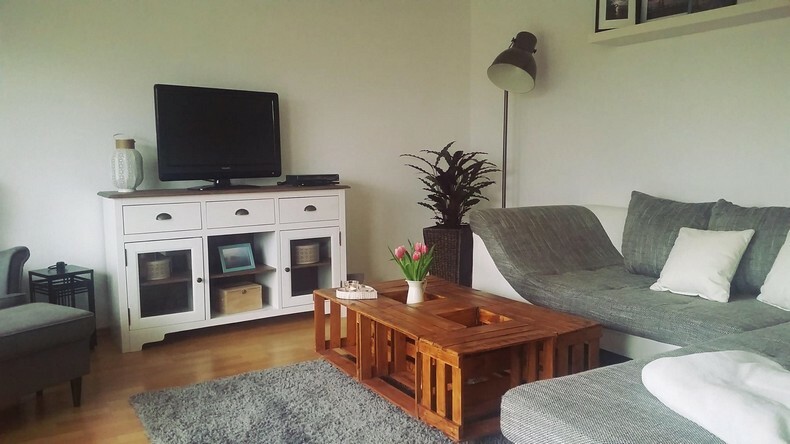 We can clearly see that the same wooden crates are used all around the structure of the coffee table. We have placed them in such a systematic manner that not only they have created full fledge wooden table but we have also got some ample space where several accessories would be placed. 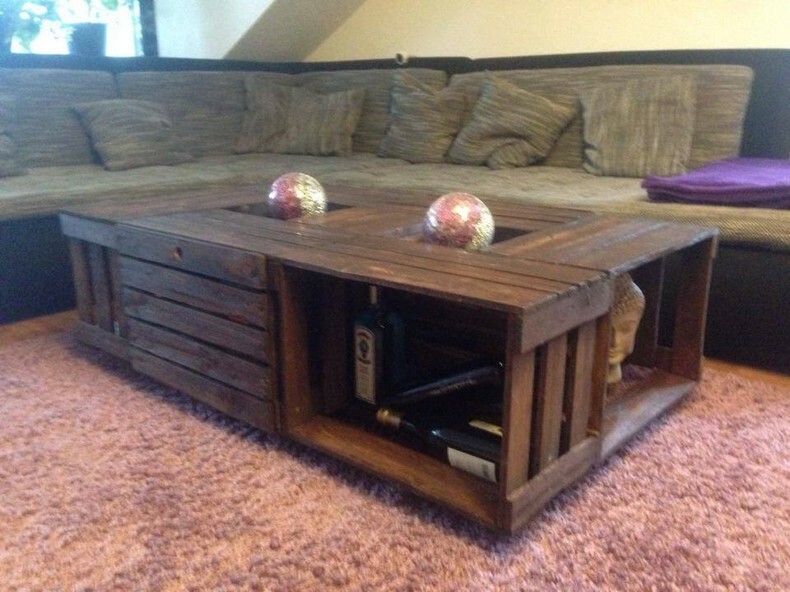 Now this one is a more modified and probably much modernized shape of the wooden crate repurposed coffee table. 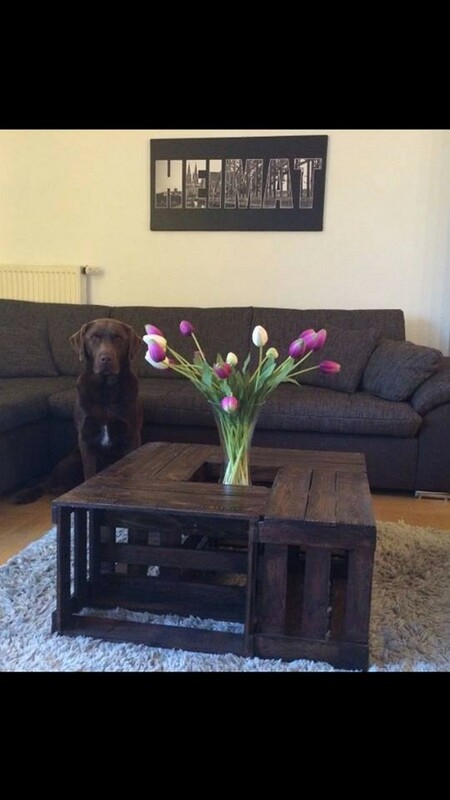 Here we have used a large number of wooden crates. Each crate is placed or attached in such a manner that its opening face is heading outwards. In this one we didn’t spare that built in space that we have spared in some earlier wooden tables. The top of this one is relatively flatter one and with another exception that are the wheels on the bottom. We didn’t stain it properly but just sanded it a bit. We are repeating the same pattern in most of the tables where each crate is heading outwards with its opening face. This is probably the perfect approach as it gives a more open look and also renders a lot of space which have been an incentive so far everyone is looking for. 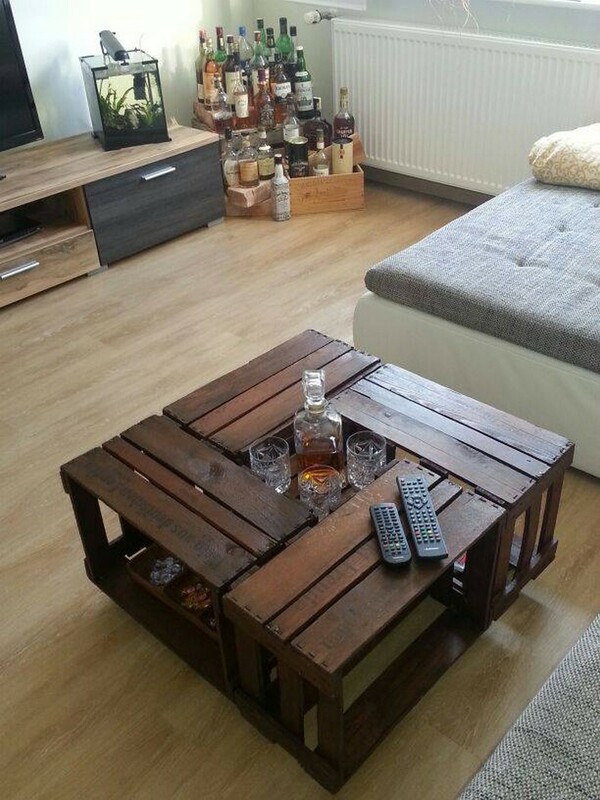 I think this wooden table made with the crates is simply too stylish to be ignored. Here we have mostly used whole wooden crates while at the base or bottom we had to cut or disassemble the wooden crate to shape a proper base for the table. We have mentioned this fact so many times that in the wood pallet recycling it is just your skill and imagination that matters the most. 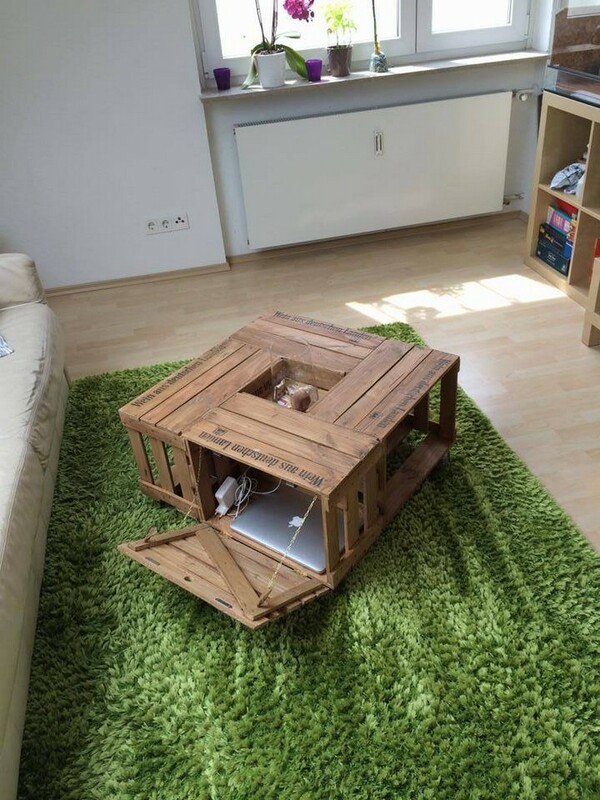 Like here we have again used the same wooden crates, but just with some little tricks and skill we have turned it into a portable wooden table. You guys would have noticed this middle space in most of the tables made using the wooden crates. Well, this is complimentary, you can place here some decent vase or you can also use this space as a tiny planter too depending on your mood and priorities. 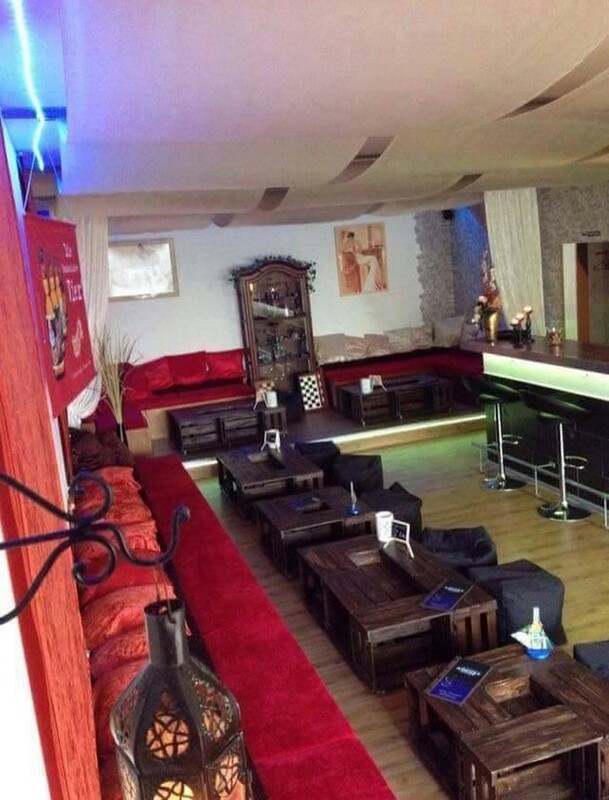 The most of earlier tables were left pretty unstained and we did that on purpose we because we feel that the wooden crates have got their own specific shade that is simply matchless in beauty and outlook. But in this one we have also experimented with some staining. 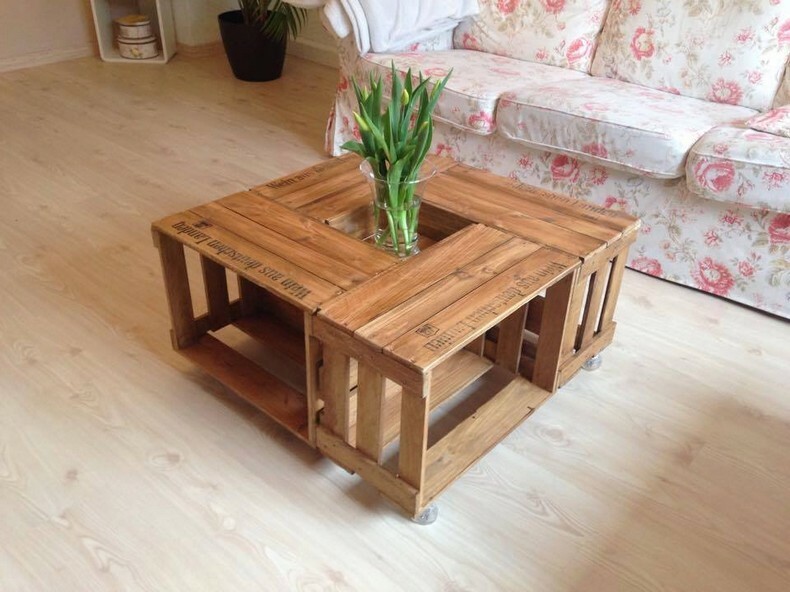 Have a look on this gently stained wooden crate upcycled coffee table, its flawed and unprofessional paint gives an amateur look that also reflects a sort of attraction maybe. I don’t exactly know but there is really something that really fascinates here. While the space is again there at your disposal. As we suggested earlier that this middle space could ideally be used to place vase here, and here we have shown the perfect demonstration of this thought. 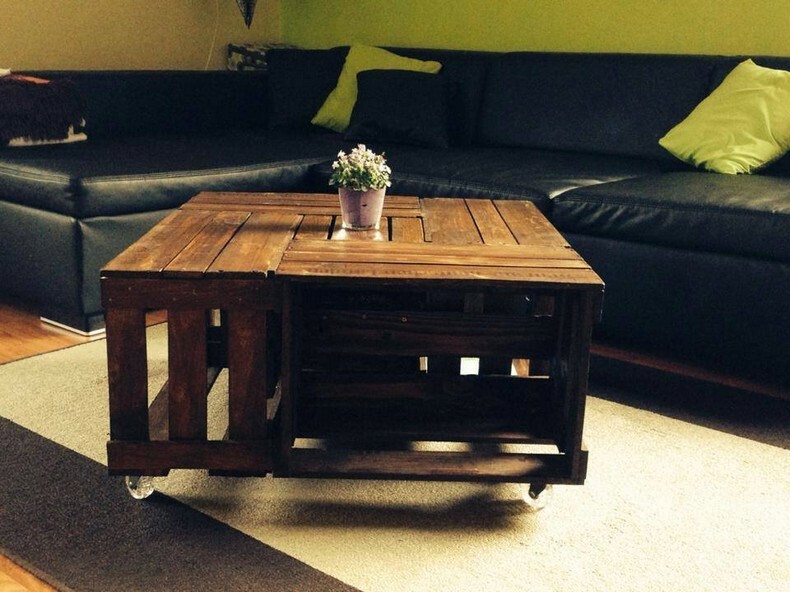 Straight four whole wooden crates are simply combined together and shaped like a squared wooden table, and the wheels on base are a much useful feature that would be counted when you have to move it from one place to another. Wow, this one is some next level sort of wooden creation. We have worked here like professionals, like we have stained and sanded the table perfectly. 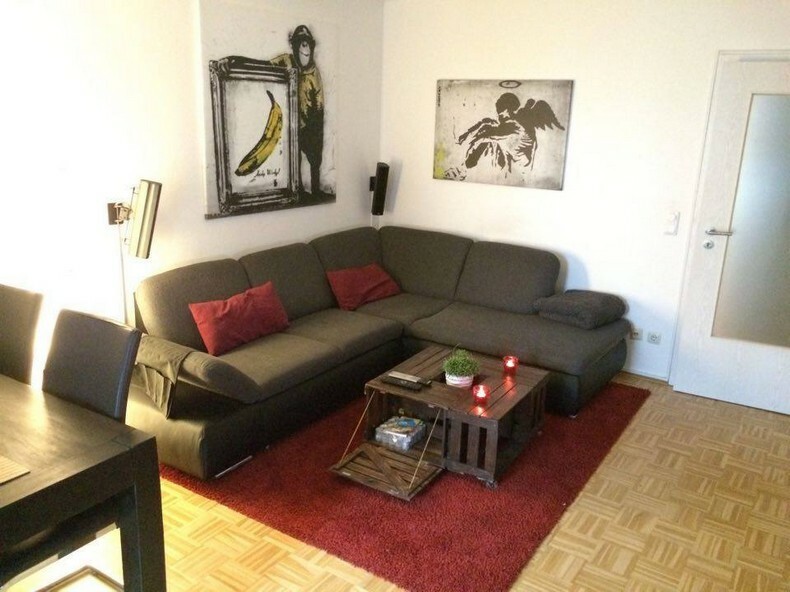 Plus the space is spared on two different places here. 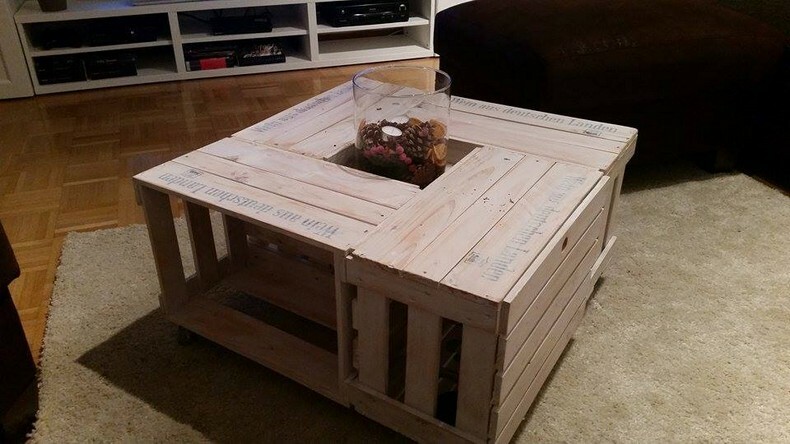 We have already seen a similar pallet wooden repurposed table made using the crates. This is a closer look into this portable wooden table. You can see the mobile charger there, this is just to give you an idea that for what sort of needs this space could be used. Even here we have used again the same pattern. We used four whole wooden crates, and the same empty space in the middle. But this time we have done very fine sanding and we have also painted it with the most attractive shade that has added a lot in its beauty. While in this project we have tried to give it the same typical shape of wooden tables that we used to make using the wooden pallet planks. As this one is much longer, a proper rectangular shape that is famously associated with conventional wooden tables. 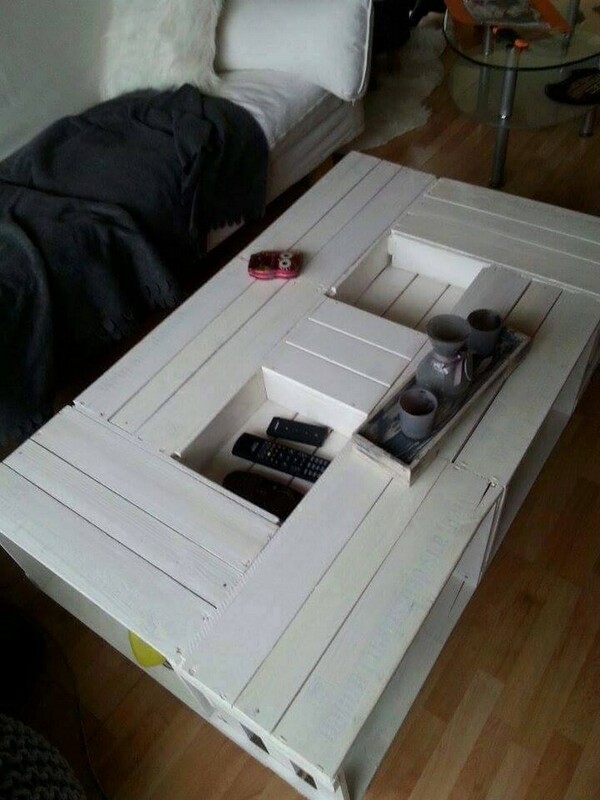 While making the same wooden furniture items or especially the tables with wood pallet planks, this one seems much easier because here we have not to do any disassembling first. 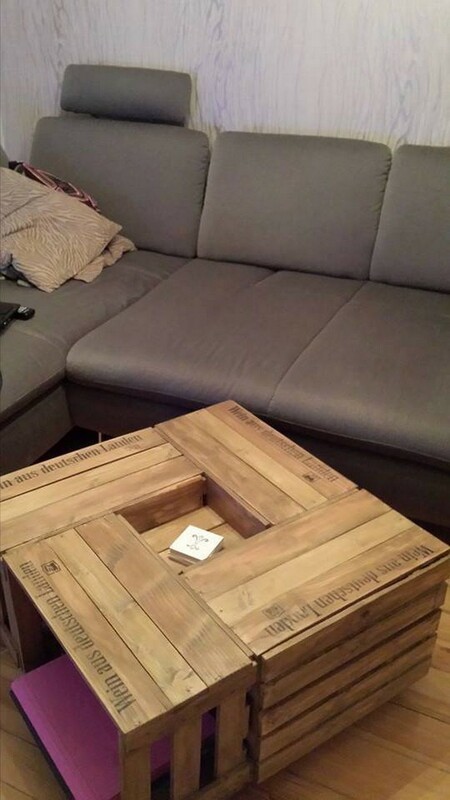 Here we simply have to combine and attach multiple wooden crates together making them look like a perfectly made wooden table. I strongly feel that this new approach is pretty perfect for bringing about some domestic room interior change. 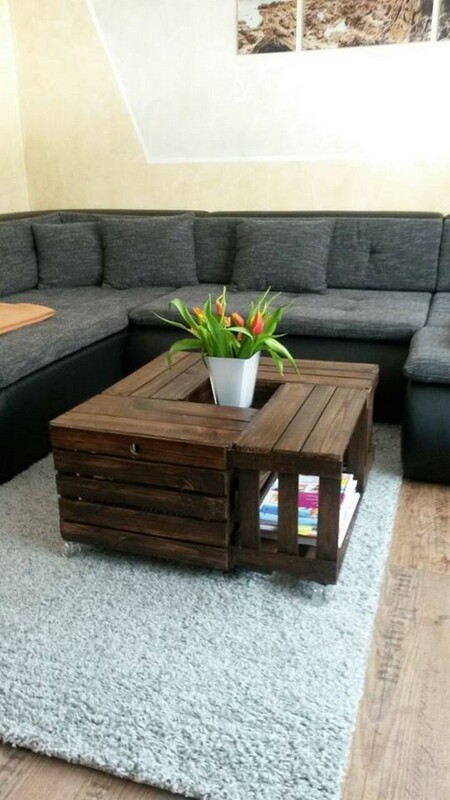 If you have had a lot of wooden pallet creations and want to switch to some other material, these wooden crates would be a perfect substitute. 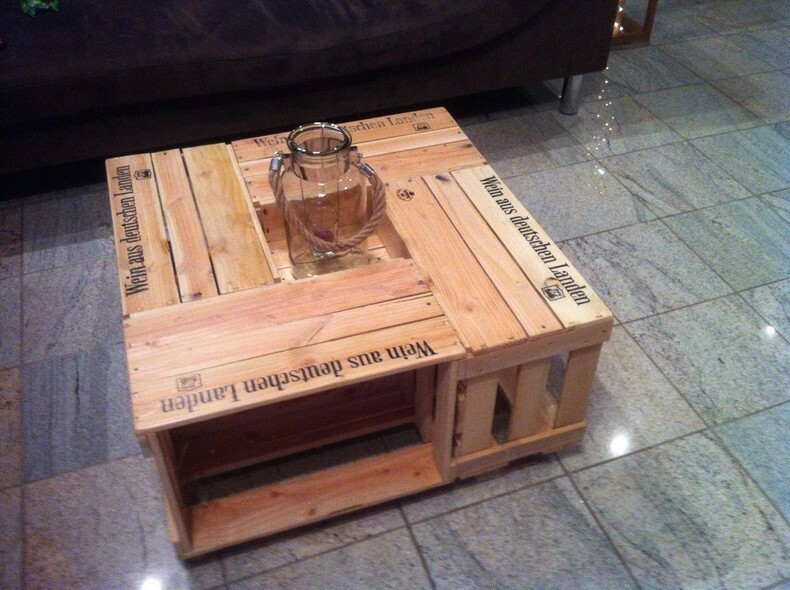 And making the wooden coffee tables with the wooden crates is probably one of the easiest task and even the beginners and amateurs can also try them. 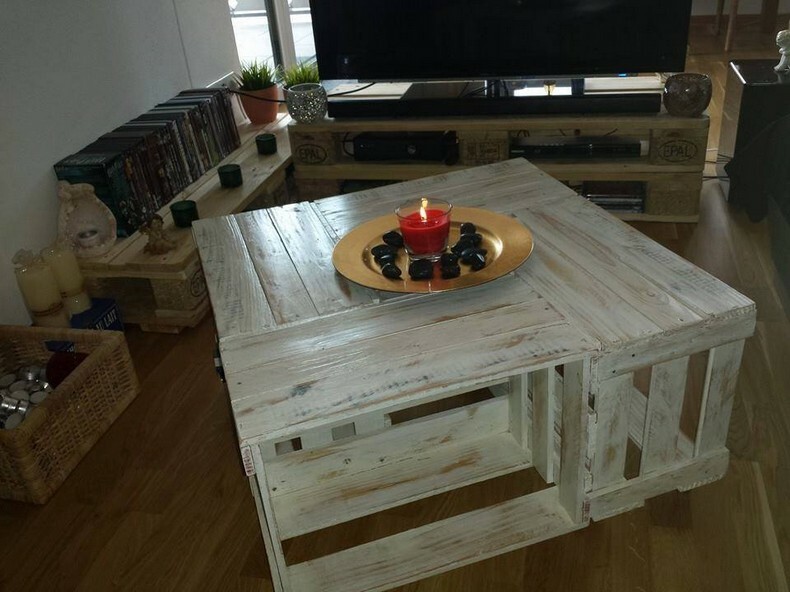 And same kind of treatment and finishing is done on these creations that we have done in the course of making wood pallet creations.